Amatrol’s Electronics Sensors Learning System (85-MT5-D) adds to Motor Control (85-MT5) to teach the function and applications of a variety of electronic sensors in industries like automotive, packaging, and security. 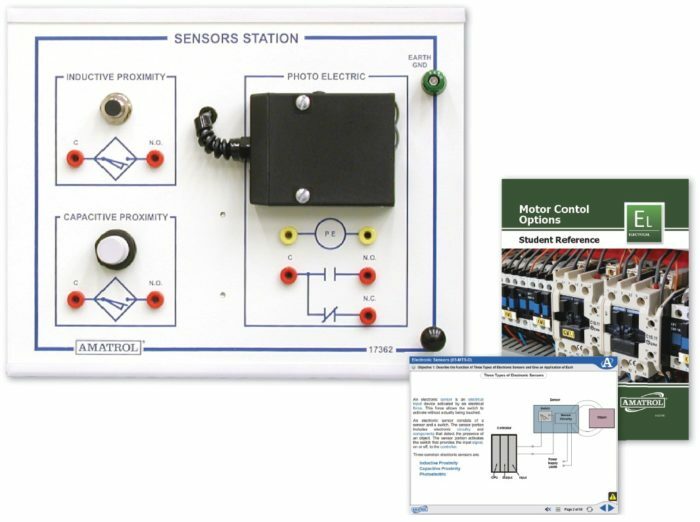 This electronic sensor training system is comprised of heavy-duty, real-world industrial components such as capacitive, inductive, and infrared sensors that are built to stand up to heavy use. Learners can connect and operate these electronic sensors, study their design, and analyze their performance in order to build skills that can be applied to real-world job opportunities. Amatrol reinforces this skill-building practice with strong curriculum that thoroughly explains electronic sensor topics such as factors that affect a sensor’s performance. This combination of hands-on skills and strong theoretical knowledge gives learners the ability to not only understand where to use a sensor in a circuit, but why it’s there and what its function is. This industrial training system offers industry-standard components so that learners can get direct, hands-on practice with the sensor installation, operation, performance analysis, and design. Specific industrial-relevant skills include designing a level sensing control circuit that uses a capacitive proximity sensor, designing a drill motor control circuit that uses an inductive proximity sensor, troubleshooting a motor control circuit with an electronic sensor, and designing a motor control circuit that will sense product jams on a conveyor system. This learning system consists of an 11-gauge steel slide-in panel that features capacitive sensors, inductive sensors, and infrared sensors. These components are pre-wired and terminated to banana jacks to allow quick connection of control circuits. This electronic sensor training system also includes wood, plastic, aluminum, and steel targets for testing sensors. In addition to hands-on skills, this motor control training expansion system’s curriculum features a strong, thorough offering of electronic sensor knowledge and topics. For instance, learners will study the operation, function and applications of inductive proximity, capacitive proximity, and photoelectric sensors, the various characteristics that affect each sensor’s operation, and schematic symbols for common sensors. This learning system’s curriculum is presented in an interactive multimedia format. This system’s multimedia curriculum utilizes text, audio, 3D graphics, and interactions in order to fully engage the learner. A sample copy of this course’s Student Reference Guide is included with the learning system. Sourced from the electronic sensor training course’s multimedia curriculum, the Student Reference Guide takes the entire series’ technical content contained in the learning objectives and combines them into one perfect-bound book. If you would like to inquire about purchasing additional Student Reference Guides for your program, contact your local Amatrol Representative for more information.